The HP 6125G/XG Ethernet Blade Switch brings the rich features of the HP Comware network operating system, that delivers a common level of features, service and security levels from edge to core. 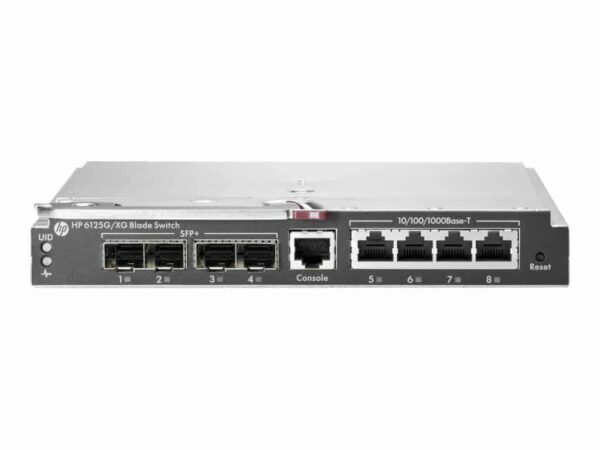 The 6125G/XG Ethernet Blade Switch 8 ports Managed Plug-in Module by Hewlett Packard Enterprise is perfect for 1G/10G low cost edge aggregation, virtualization, scale-out, and hyper-scale environments that require a 1G/10G connectivity. The HPE 6125G/XG Ethernet Blade Switch with Intelligent Resilient Framework (IRF) – Creates virtual resilient switching fabrics and Switches do not have to be co-located and can be attached using standard LACP for automatic load balancing and high availability. The HPE 6125G/XG Ethernet Blade Switch is a cost effective solution and provide excellent investment protection full layer 3 routing with IPv6 support.